Gravity Conveyor RS14 | 1.4"
Aluminum gravity skatewheel conveyor is ideal for conveying light packages or for applications where conveyor portability are required. 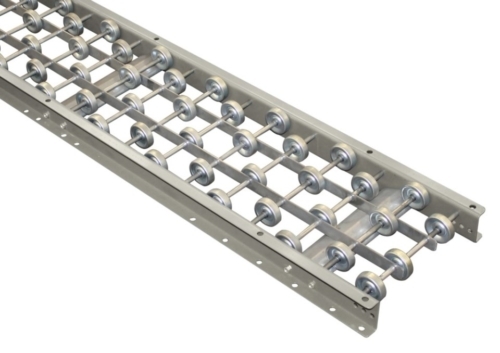 They are useful for temporary conveyor lines in assembly and delivery applications. 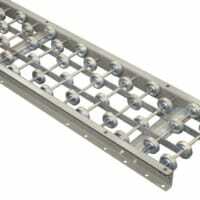 They can also be used to establish simple part feeding systems with the conveyor on a gentle incline. Join multiple units together in 5′ or 10′ sections to create the required total length. Use optional adjustable height legs to set the incline angle as desired. Wheels: 1-15/16″ diameter aluminum with ball bearings in hardened raceway. Lubricated for life.